Roll up Roll up the Magical History tour is coming to take you away jump onboard and be transported back to the Swining Sixties. Step back in time when Britain was in full swing and London was the only place to be where anything was possible. Do you remember when the pirates took over the air waves with their hip new station Radio Caroline playing music by The Kinks, The Rolling stones and of course those lovable lads from Liverpool The Beatles? There was a young generation looking for something new and for something fresh but apart from that something they could all relate to and that golden decade has been at the forefront in the hearts and in the minds of us all. 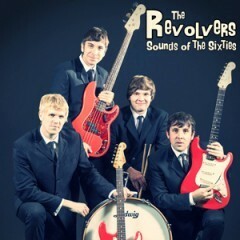 “The Revolvers” would like to take you on a nostalgic trip through to the early days of the Cavern Club Mersey beat era then onto the hazy daze of Height Ashbury and after all of that the last ever performance the Beatles did on the roof top of the Apple Corps building in January 1969. See “The Revolvers” Perform such hits as “I want to hold you’re hand”, “Happy together”, “Pinball wizard” , “Mr tambourine man” and many many more. “The Revolvers” are suited and booted wearing only period clothing bringing the excitement of London’s famous Carnaby street where young mods came from every corner of the globe to try and have a piece of swinging London and be apart of the counter culture movement.